List of Birds, bird photos, bird pictures, birds image, bird species, name of birds. 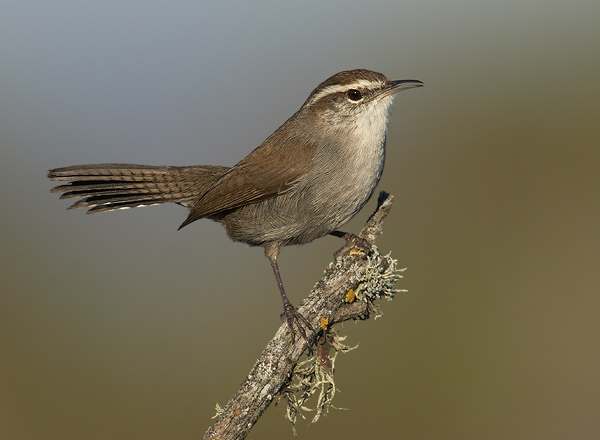 Vocal and plumage variation in the Bewick’s wren is extensive, but all adults have a very long tail, tipped in white and flicked side to side. Eastern populations have disappeared from much of former range and are in continuing decline; conversely western populations are stable or increasing and/or expanding. Polytypic. Length 5.1" (13 cm). Identification Long, mobile tail with attenuated body shape and active demeanor impart a lean look. Adult: one molt a year; sexes similar. Plumage variable, but all subspecies gray-brown to rufous-brown above, gray-white below, with long, pale supercilium. White-tipped tail has black bands. Juvenile: plumage subtly paler than adult’s. Geographic Variation Complex, extensive. Variation in darkness of upperparts generally follows Gloger’s Rule, with paler populations in the arid Southwest and intermontane West vs. darker populations in the East and Pacific Northwest. Some or all populations exhibit color polymorphisms, and random individual variation is extensive; 10 subspecies north of Mexico; 5 others in Mexico. 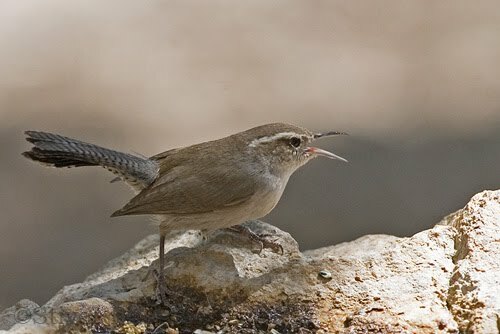 Similar Species In most of range distinctive tail and supercilium prevent confusion with other wrens. Where populations of the eastern subspecies-group overlap with Carolina wren, confusion possible. However, Bewick’s is not as brightly colored as Carolina, and the long, white-tipped, expertly maneuvered tail of Bewick’s is diag­nostic. Bill longer, thinner than Carolina’s. Voice Varied. In many places in the West, the Bewick’s wren produces the local “mystery song.” Call: variable, but many notes with raspy or buzzy quality, some quite loud. Song: most songs combine 1–5 short, breathy, buzzy, notes (sometimes run together in a short warble) with a longer, often loose, trill. Single buzzy or nasal notes may be introduced. Overall rhythm and tone remind many observers of the song sparrow, but elements in the song of Bewick’s are usually thinner, buzzier. Songs of birds in the interior subspecies-group (ero­moph­ilus group) are simpler than those from the far West or east of the Mississippi. Status and Distribution Western populations are mainly uncommon to fairly common; locally common. 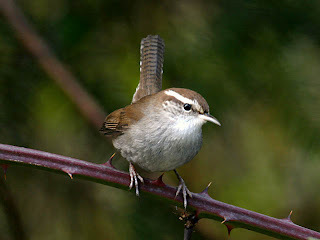 Eastern subspecies-group (bewickii group) declining; altus subspecies (“Appalachian” Bewick’s wren), of questionable tax­­onomic validity, reduced to remnant populations; nominate bewickii subspecies, centered in Ozarks, declining. Abundance of any population may be underestimated by observers unfamiliar with song. Breeding: habitat types more variable than for most wrens, but shrubby vegetation always a requirement. Western individuals frequent arid juniper foothills, lush riparian corridors, residential districts, etc. Eastern subspecies-group formerly inhabited open woodlands; now prefers areas with human junk. Migration: western populations largely sedentary. Eastern populations migratory, with general pattern of dispersal south and west following breeding. Winter: as breeding, with generally warmer and lower-elevation component. Vagrant: extralimital records difficult to assess. Apparent vagrants in the East may be remnants, natural migrants, or actual vagrants. Apparent vagrants in the West may refer to advance-guard birds involved in range expansions. In lower Missouri and Arkansas River Valleys, distinguish between potential vagrants of eastern versus western populations. Population Several western populations are increasing (e.g., in Oregon, Nevada, and Arizona). Subspecies altus once ranged northeast to New York and Ontario, but now limited to a few relict populations in the Ohio and Tennessee River Valleys. Competition with house wren thought a major factor in the Bewick’s decline, but direct evidence for long-term competitive exclusion not proven.